Colourful Badge for Book Lovers. This bright rainbow badge has the text The Library Is My Second Home written in a black font and a stack of books. 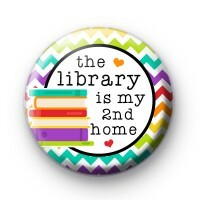 This is a lovely badge for avid readers and supporters of their local Library. If you adore reading or know someone that is a massive bookworm then this fun book-themed badge might be perfect for them. We have a huge book and reading themed selection of badges in the shop and we think they're great for schools, libraries or book clubs or just to spread the message that you love to read.